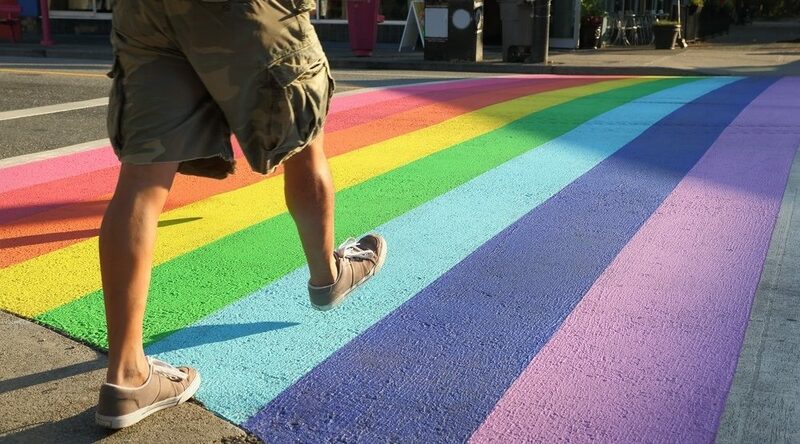 Local LGBTQ activists will be asking Coquitlam City Council today to consider the idea of installing new multi-coloured crosswalks that celebrate the LGBTQ community. Nicola Spurling with the Tri-Cities Pride Society told Daily Hive two crosswalks are envisioned. There would be a transgender crosswalk, painted with the colours of the transgender flag (blue, pink, and white), on Brunette Avenue in the Maillardville neighbourhood, which would make it Metro Vancouver’s first crosswalk supporting transgender individuals. Another crosswalk with rainbow colours for the LGBTQ Pride would be at a more prominent location, possibly on Pinetree Way near City Hall, the library, and SkyTrain. “The idea behind the rainbow crosswalk is to show the residents and future residents of Coquitlam that the City is accepting and supports them and we’re a diverse community,” she said. The Society will be taking its idea to City Council this afternoon and has already spoken to a number of councillors on what their level of support is and the challenges the installations would have to overcome, especially cost. Two other permanent LGBTQ rainbow crosswalk installations already exist in the region. Four rainbow crosswalks painted in 2013 at the intersection of Davie Street and Bute Street in downtown Vancouver have since been replaced with a new three rainbow crosswalk design as part of the Jim Deva Plaza project. In 2015, a rainbow crosswalk was installed at the intersection of Church Street and Columbia Street in downtown New Westminster.